The hardest thing a rebel can do isn't standing up for something - it's standing up for himself. Life takes delight in stabbing Gus Scott in the back when he least expects it. After Gus spends years running from his past, present, and the dismal future every social worker predicted for him, karma delivers the one thing Gus could never - would never - turn his back on: a son from a one-night stand he'd had after a devastating breakup a few years ago. 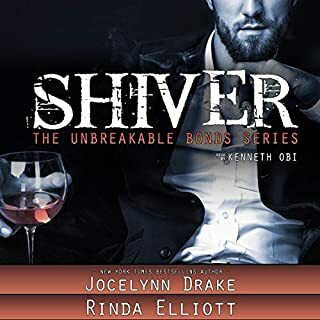 Returning to San Francisco and to 415 Ink, his family's tattoo shop, gave him the perfect shelter to battle his personal demons and get himself together...until the firefighter who'd broken him walked back into Gus's life. For Rey Montenegro, tattoo artist Gus Scott was an elusive brass ring, a glittering prize he hadn't the strength or flexibility to hold on to. Severing his relationship with the mercurial tattoo artist hurt, but Gus hadn't wanted the kind of domestic life Rey craved, leaving Rey with an aching chasm in his soul. When Gus's life and world starts to unravel, Rey helps him pick up the pieces, and Gus wonders if that forever Rey wants is more than just a dream. Get ready to have your heart broken and pieced back together. 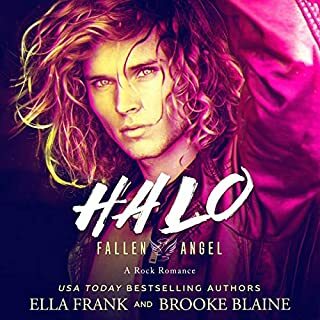 There were two things I absolutely loved about this audiobook - Tristan James's narration and the cameo of narrator Greg Tremblay to voice an established character from Rhys Ford's Cole McGinnis series. Gus Scott hasn't had it easy. In fact, in the grand scheme, once could argue he's never had anything easy. He's had his heart broken by almost everyone, including firefighter Rey Montenegro. Three years ago Gus was shattered after a devastating break-up with Rey. It was just one more time that he was disappointed by someone who should have been there for him. 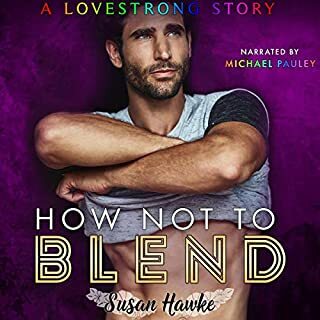 Gus left town six months ago, but he's back and ready to pick up the pieces of his life, and Rey is determined one of those pieces is going to be him. Told from both Gus's and Rey's third-person POV Rebel focuses on Second Chances, found family, loss, and love. There is some romance here but it's not the main focus, though Rebel does offer up some heart-melting moments. "Listen to me carefully. I’m not going to spend my life anyplace other than with you, and I love you. With all of my heart. All of my soul and most of my sanity… I love you." Tristan James provides a nuanced, textured, and beautiful interpretation of Rhys Ford's text. Quite a bit happens off page, many of which I think could have added more depth to the story overall, but in the end I enjoyed Rebel and I'm looking forward to getting the stories for the supporting cast of characters here - especially Bear and Ivo. Looks like Mace is up next and (hopefully) we'll also get a feature for Luke. I, for one, really hope Tristan will be back to narrate the rest. What a great story to start off a new series! Wonderful combination of writing and narration -- Rhys Ford and Tristan James are a perfect twosome!! You can't find better. This is an engaging and heartstring-tugging story with the strong character work for which Rhys Ford is known. 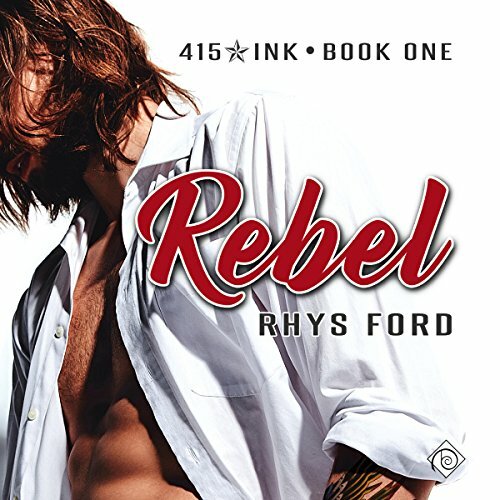 “Rebel”, the opener for the new 415 Ink series, is about found family, confronting demons and stepping up for people even when it seems impossible and features a second chance, slow burn romance. Gus’s childhood is ugly and traumatic and in multiple, sometimes horrific ways reinforced the idea that he is unworthy and disposable, a belief that contributes to his inability to recognize the good things about himself and being open with people he cares about, even family. After discovering he has a child, Gus is forced to examine who he is and who he wants to be in order to be a good dad, a task that also involves confronting his unresolved feelings for his ex and close friend of the family, Rey. Unbeknownst to Rey, Gus was in love with him and in Gus’s mind, the breakup was just another nail in the coffin of his disposability. To me, the story is more about Gus opening his baggage and being honest about what it costs him to carry it so that he can finally move forward with his life and be better for himself and his son instead of continuing in the directionless limbo he wrapped himself in. In some ways, Gus and Rey’s romantic history serves more as a tangible example of this process than as the main storyline. Having the central romance be of the second chance variety is a good way to begin a series that features characters with complicated and heavy histories since a large part of the story is concerned with the intricacies of how their family came together and the after effects of the trauma that dominated Gus’s childhood and shaped his behavior. There is much angst and emotional turmoil in “Rebel”, but it is also full of love, hope and the wonders of inking. This is a good story. I had some trouble with the narrator. It was sometimes hard to tell who was talking between the brothers. It was also kind annoying how he would say "brotherss" or "kidsz". I'm pretty sure it was probably written brothers' as in plural possessive but the narrator liked to add on the extra s at the end of the words. Very strange. 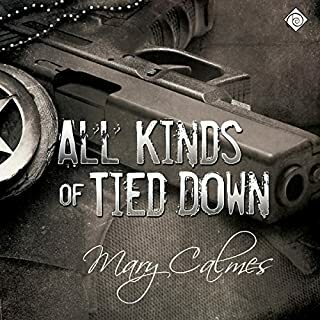 I've had this book forever, but when I saw it was available in audio, I grabbed it knowing that I was more likely to get it off my TBR list that way. I'm so happy that I got to read it...and just in time since book #2 is coming out really soon. So...this book...It hits one of my weak spots for tropes...the second chance at love story. Rey and Gus were together until Rey blew them apart three years ago. That breakup completely blindsided Gus. He never saw it coming and it completely broke him. He's been avoiding coming home ever since because he can't see Rey without it shredding him inside. But something's changed which means he can't avoid home...and Rey...anymore. Rey and Gus both have a lot of messed up emotions that they have to sort through in this book. They were both really hurt by what happened between them and that isn't something that just suddenly heals. And all of this is happening in the middle of lots and lots of family drama and side-plots. It really made for an interesting and entertaining read. Wow, this is a group of seriously messed up guys. The brothers (Gus's) have been through hell and back, but they're even closer for it. But all those mental scars and hangups are still there. It's going to be a phenomenal series that I think will probably get better and better with each book as the story deepens. A favorite narrator and favorite author, can't beat that. Tristan James always delivers and amazing performance. He is one I look for the narration then the book. Yes, this book was amazing as anything written by Rhys Ford is, but to end this book with that tidbit of delightful tension, that tease that will make my heart ache until I can have the next book downloaded on my phone? Oh my goodness! Give me! I need more Ray, more Gus, and more of all the brothers. Every last one! Rhys Ford books are hit and miss for me. Some are great, others are in desperate need of an editor. This book is one of those. 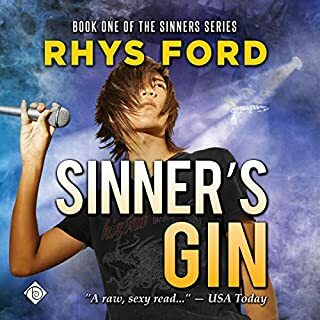 I have rarely read an author who annoys me as much as Rhys Ford with her superfluous word usage and overlong sentences. The prologue in this book is a perfect example. Ford turns the action ' A man wakes up-smells smoke- gets out of bed' into three-thousand words. Maybe some readers like getting the same action repeated with alternative word usages for five pages, but I was eye-rolling within the first minute and knew i'd made a mistake in purchasing this book. I never discovered if there was a good story here because it was hidden among the paragraphs of pointless internal dialogue and repetitive description.